Sunday morning in Belgrade was cold, bleak and wet. It was a typical winter's day, with very little to distinguish it from any other. The most famous leader of the former Yugoslavia may have just died, but there is little to suggest his passing will be much missed here. There is no outpouring of grief, no protests, no tears. Outside the federal parliament building people walked their dogs, hurried through the drizzle and got on with life as usual. Five years ago this area was swamped with hundreds of thousands of protesters. They stormed the parliament, finally deposing Slobodan Milosevic after a decade at the helm. Today the Serbian flag flies above the building, but - notably - not at half-mast. He may have been a former president, but he is no longer respected. State broadcaster Radio Television Serbia began its morning news bulletin not with Mr Milosevic, but a different former leader. 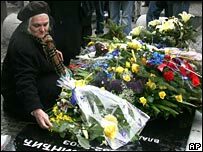 Sunday is the third anniversary of the assassination of Zoran Djindjic, the reformist prime minister who helped to topple Mr Milosevic. It is clear which former leader the state would rather its people remember. Serbia's tabloid press has meanwhile worked itself into a frenzy over claims by Mr Milosevic's Serbian lawyer that he may have been poisoned at The Hague tribunal. "Murdered!" screamed the headline on one newspaper. "The Hague killed Milosevic" said two more. They are tapping into a deep-seated resentment within Serbia against the UN war crimes tribunal. There is a belief that it is biased against Serbs, and the news that another one has died in its custody has fuelled suspicions in a country which is fertile ground for the conspiracy theory. Any suggestion of incompetence on the part of The Hague will be seized upon. Serbia is under intense pressure to hand over the last of the fugitives accused of war crimes, in particular Ratko Mladic, the former head of the Bosnian Serb army. The European Union has warned if he is not arrested by the end of this month, it will disrupt negotiations which Serbia hopes could eventually result in membership. Now nationalists in Belgrade are saying once more that Serbs cannot be entrusted to The Hague. 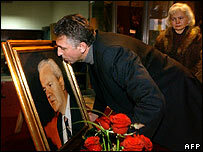 And what of Mr Milosevic's funeral? Will it be here in Serbia and Montenegro, and if so what kind of send-off will he get? His wife, son and daughter all have criminal charges outstanding against them here. Two are in Russia, another in Montenegro. They won't come to Belgrade without guarantees they'll be left alone. But if the government caves in, what message will that send to the outside world and the thousands of Serbs who hate the Milosevic family? The family says it has made no decision, but his body may well end up in Russia. Few here will resent that. He may have cast himself as saviour of the Serbs, but he led them to defeat and poverty. And his death has reminded them of a chapter in their history that the vast majority would rather forget.